Cancer progression is associated with inflammation, increased metabolic demand, infection, cachexia, and eventually death. Myeloid-derived suppressor cells (MDSCs) commonly expand during cancer and are associated with adaptive immune suppression and inflammatory metabolite production. We propose that cancer-induced cachexia is driven at least in part by the expansion of MDSCs. MDSC expansion in 4T1 mammary carcinoma-bearing hosts is associated with induction of a hepatic acute-phase protein response and altered host energy and fat metabolism, and eventually reduced survival to polymicrobial sepsis and endotoxemia. Similar results are also seen in mice bearing a Lewis lung carcinoma and a C26 colon adenocarcinoma. However, a similar cachexia response is not seen with equivalent growth of the 66C4 subclone of 4T1, in which MDSC expansion does not occur. Importantly, reducing MDSC numbers in 4T1-bearing animals can ameliorate some of these late responses and reduce susceptibility to inflammation-induced organ injury and death. In addition, administering MDSCs from both tumor- and nontumor-bearing mice can produce an acute-phase response. Thus, we propose a previously undescribed mechanism for the development of cancer cachexia, whereby progressive MDSC expansion contributes to changes in host protein and energy metabolism and reduced resistance to infection. Cancer-associated cachexia is a multifactorial syndrome that develops in the latter stages of malignancy and is associated with an acute-phase response, loss of body protein and/or fat, and immune dysregulation (1–3). Cachexia is a chronic inflammatory syndrome that manifests predominantly as the progressive wasting of body fat and/or protein and changes in energy balance that cannot be explained by anorexia alone, and is associated with an ongoing hepatic acute-phase response, anemia, hyperlipidemia, and presence of sickness syndromes (4). Clinically, cancer patients who develop cachexia are more susceptible to infection and sepsis (5). The systemic release of proinflammatory cytokines, such as TNF-α, IL-1β, and IL-6, from tumor-derived tissues and innate immune effector cells is still often promulgated as the primary etiology of cancer cachexia (3, 6), but multiple clinical studies have demonstrated that these inflammatory mediators cannot be wholly responsible for the complexity of this syndrome (7–9). Therefore, the processes that drive development of cancer-associated cachexia remain unanswered. Several groups have hypothesized that activation of innate immunity and inflammation during active tumor growth may play a role in the development of cachexia (2, 3, 10–12). Tumor-induced amplification of the myeloid compartment leads to the expansion of myeloid-derived suppressor cells (MDSCs), which are immature precursors of the myeloid lineage (13, 14). MDSCs were initially discovered in abnormally high numbers in the setting of advanced malignancy, although they have since been demonstrated in a variety of other inflammatory conditions, including autoimmunity and sepsis, with their primary function being to suppress adaptive immune function (14, 15). We demonstrate in this work that, regardless of the tumor type, increasing tumor burden and MDSC expansion >100-fold over the course of tumor progression are associated with increased energy expenditure, loss of tissue adiposity, a hepatic acute-phase protein response, and ultimately reduced resistance to infection. These responses are not seen to the same degree in animals with a histologically similar, primary tumor burden, but in the absence of MDSC expansion. Additionally, depletion of all phagocytic cells, including MDSCs, in advanced tumor growth improves outcome to a subsequent inflammatory challenge. Administration of putative MDSCs from either a nontumor- or tumor-bearing mouse to a healthy animal induces an acute-phase response. Although a direct causal relationship between the development of cancer cachexia and increased mortality to sepsis and inflammation with the expansion of MDSCs cannot be conclusively proven, we can conclude that the development of cachexia is at least partly explained by the massive expansion of immature myeloid populations associated with a growing tumor. Therapies already in the clinic targeting MDSC expansion in patients with advanced cancer may have the additional benefit of reducing sickness syndromes and cachexia. All experiments were approved by the Institutional Animal Care and Use Committee at the University of Florida, College of Medicine, before their initiation. Mice were maintained on standard food and water ad libitum. Six- to 8-wk-old BALB/c and C57BL/6j female mice were purchased from The Jackson Laboratory (Bar Harbor, ME) and were used between 7 and 9 wk of age. All mice were maintained in specific pathogen-free conditions at a breeding colony at the University of Florida Health Science Center. The murine mammary carcinoma, 4T1, was obtained from D. LaFace, Merck Research Laboratories (Palo Alto, CA), and the 66C4 subclone of 4T1 was obtained from F. Miller, Karmanos Cancer Institute (Detroit, MI). Lewis lung carcinoma (LLC) and colon-26 adenocarcinoma (CT26) cells were obtained originally from American Type Cell Culture (Manassas, VA). All cell lines were grown in DMEM with FBS and penicillin/streptomycin (Cellgro, Manassas, VA). On the day of tumor inoculation, cultured cells were trypsinized, washed in PBS (Invitrogen Life Technologies, Carlsbad, CA), and injected into the right flank of mice. A total of 7 × 103 tumor cells per animal was injected. A splenocyte cell suspension was made from spleens harvested from day 28 post-4T1 inoculation animals or healthy, nontumor-bearing animals. To remove RBCs, splenocyte suspensions were then overlayed on top of Histopaque 1119 and centrifuged (Sigma-Aldrich, St. Louis, MO). RBC-depleted splenocyte suspensions were then stained with anti–Gr-1 allophycocyanin (Miltenyi Biotec, Auburn, CA) and antiallophycocyanin microbeads (Miltenyi Biotec), and run over a MACS column twice (Miltenyi Biotec). Purity was verified via flow cytometry, and yields were consistently >95% pure. For adoptive transfer experiments, naive BALB/c animals were injected i.v. with 1 × 107 magnetically enriched Gr-1+ cells from 4T1-bearing animals on days 1, 3, and 5. Serum was collected on days 2, 4, 6, 10, and 14 and assayed for concentrations of serum amyloid A, haptoglobin, and hemopexin. Spleens were harvested, and single-cell suspension was made by passing cells through a 70-μm pore-size cell strainer (Falcon, Heidelberg, Germany). Erythrocytes were lysed with an ammonium chloride lysis solution. Cells were then stained with either anti–Gr-1 allophycocyanin, anti-Ly6G allophycocyanin, anti-Ly6C PerCP Cy5.5, CD11b R-PE-Cy7, or CD31 R-PE. All Abs were purchased from BD Pharmingen (San Jose, CA), unless otherwise noted. Total body adipose, lean, and fluid measurements were taken at 0, 14, and 28 d posttumor inoculation by time domain–nuclear magnetic resonance (TD-NMR; Bruker, Madison, WI). In tumor-bearing animals, the primary tumor was removed before measurement. Oxygen consumption was assessed in mice with an oxygen analyzer (model S-3A; AEl Technologies, Naperville, IL). Flow rates were 300 ml/min with a 1-min sampling time at 8-min intervals. The mice were acclimated to the measurement chambers for at least 1 h before measurements were taken. Oxygen consumption was then assessed for the next hour. Food was not available during this time period, and all measurements were taken during the light portion of the diurnal cycle. Results are expressed as mL/min/kg body weight or mL/min/per kg tumor-free lean body mass (kg). Lean body weight was assessed using TD-NMR. Serum was collected via intracardiac puncture from day 28 post-4T1, LLC, and CT26 inoculation, and day 35 post-66C4 inoculation and assayed via Luminex multiplex cytokine array (Miltenyi Biotec). Serum concentrations of IL-1β, TNF-α, IL-6, and IFN-γ were then determined. Blood was harvested via intracardiac puncture from tumor- or nontumor-bearing mice at 0, 7, 14, 21, 28, and 35 d posttumor inoculation. Plasma was then assayed via ELISA for serum amyloid A, haptoglobin, and hemopexin (Life Diagnostics, Westchester, PA). Serum was collected from day 21 post-4T1 inoculation, day 28 post-66C4 inoculation, and NT-bearing animals at 0, 6, and 12 h post-LPS administration and assayed for the presence of aspartate aminotransferase/alanine aminotransferase via a Dimension Xpand Plus Integrated Chemistry System (Siemens, Deerfield, IL). Nontumor-bearing mice and animals having similar primary tumor burdens (66C4-bearing animals 38 d postinoculation and 4T1-bearing animals 28 d postinoculation) were injected i.p. with 50 μg LPS from Escherichia coli O26:B6 (Sigma-Aldrich). Mice were followed every 6 h for 72 h for survival. Polymicrobial sepsis was induced via cecal ligation and puncture, as previously described (16, 17). Briefly, laparotomies were performed, and the cecum was ligated and punctured through and through with a 25-gauge needle in nontumor-bearing mice and animals having similar primary tumor burdens (66C4-bearing animals 35 d postinoculation and 4T1-bearing animals 28 d postinoculation). Animals were followed every 12 h for 7 d postprocedure for survival. BALB/Cj mice 28 d post-4T1 inoculation were injected with either PBS or clodronate liposomes (Encapsula Nanosciences, Nashville, TN) i.p. at 100 μL liposome suspension/10 g body weight. An additional cohort of nontumor-bearing mice was also injected with PBS liposomes. Animals were then monitored for 36–48 h. Next, mice were injected with LPS (50 μg) i.p. and followed for 72 h for survival. A separate cohort of PBS and clodronate liposome injected mice was euthanized and necropsied. Spleens were harvested and analyzed for the presence of absolute numbers of CD11b+ and Gr-1+ cells via flow cytometry. Lung and liver tissues were harvested at 0, 6, and 12 h postsublethal endotoxin challenge. Tissues were subsequently fixed in 10% formalin overnight and paraffin embedded. Five-micron sections of liver and lung were then stained with H&E. Paraffin-embedded lung tissues were also stained with Ly6G+ via immunohistochemistry. Briefly, 5-μm sections were deparaffinized and exposed to sodium citrate for Ag retrieval. Sections were then stained with anti-Ly6G (Ebioscience, San Diego, CA), developed using diaminobenzidine (Vector Laboratories, Burlingame, CA), and counterstained with hematoxylin. Differences among groups were evaluated by Student t test, Fisher’s exact test, or one-way ANOVA using SigmaPlot v11 (Systat Software, San Jose, CA). Significance was determined at the 95% confidence level. MDSCs have been demonstrated by multiple investigators to not only expand to >100-fold in tumor-bearing animals, but also to produce increased amounts of both reactive oxygen species (ROS) and NO (13, 18). Although these properties have been assumed to explain the suppression of Ag-specific T cell responses, they are also potent mediators of antimicrobial pathogen defense (13, 18, 19). As shown in Fig. 1, 4T1 tumor growth is associated with a massive increase in the number of Gr-1+CD11b+ splenocytes. By 28 d, the number of splenic Gr-1+CD11b+ is increased to >1 × 108 cells/spleen. We have phenotyped these cells, and ∼5% are CD31+ and >90% are MHC-IIdim/− (data not shown; Supplemental Fig. 1). 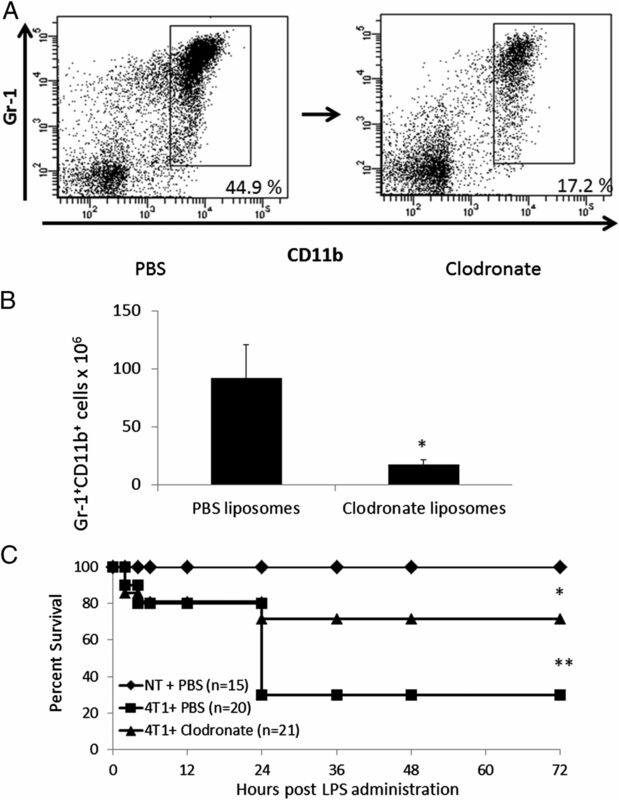 In contrast, the 4T1 subclone, 66C4, does not exhibit any increase in the number of Gr-1+CD11b+ cells (Fig. 1). These expanded Gr-1+CD11b+ cells produce increased amounts of ROS and suppress T cell proliferation compared with Gr-1+CD11b+ cells from 66C4 and nontumor-bearing animals (data not shown) (13). 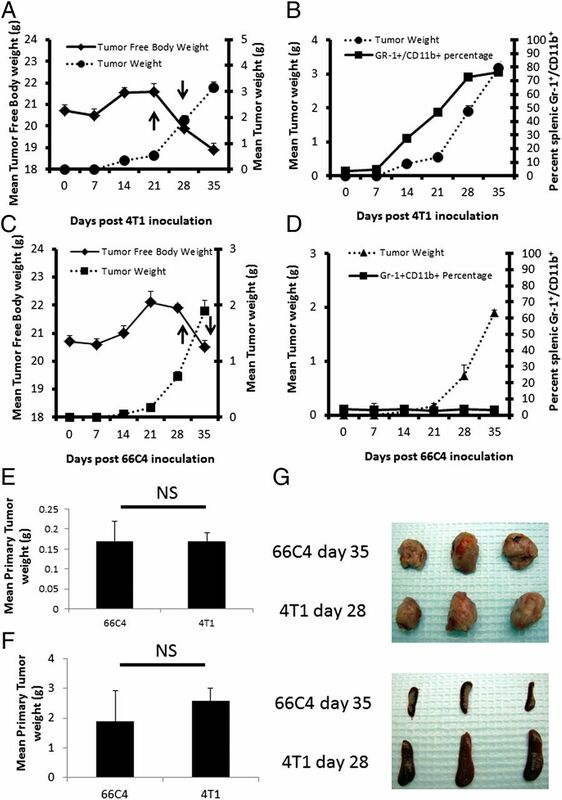 Due to the fact that the in vivo growth of 66C4 is slower than 4T1, 66C4-bearing animals were inoculated ∼7 d before 4T1 animals so that experiments were conducted in mice with comparable primary tumor burdens and after the animals had experienced a loss in total tumor-free body weight (Fig. 1). In vivo growth kinetics of 4T1 and 66C4 mammary carcinoma. The 4T1 and 66C4 tumor cells were inoculated into BALB/c mice and followed for 35 d. (A and C) Body and tumor weight measurements were taken at 7-d intervals up to day 35. (B and D) Spleens were harvested from animals and assayed via flow cytometry for MDSCs also at 7-d intervals (Gr-1+, CD11b+). Values represent percentage of live cells ± SD (n = 5). (E) Comparison of primary tumor burden at day 35 post-66C4 inoculation and day 28 post-4T1 inoculation. (F) Comparison of primary tumor burden at day 35 post-66C4 inoculation and day 28 post-4T1 inoculation. (G) Primary tumors and lungs from 4T1 (28 d postinoculation) and 66C4 (35 d postinoculation). Cancer cachexia is generally associated with advanced tumor growth in most human and murine cancers (1–3). The energy demands incurred by progressive tumor growth and its effect on host tissues lead to changes in body composition (i.e., changes in total lean or adipose tissue) and is one of the primary components responsible for cachexia in cancer-bearing hosts (1, 2). To address the question of whether the expansion of MDSCs can explain the increases in energy expenditure or oxygen consumption (VO2) in tumor-bearing animals, we compared both body composition and energy expenditure via TD-NMR and VO2, respectively, in 4T1, 66C4, and nontumor-bearing mice at 0, 14, and 28 d posttumor inoculation. Although no losses in nontumor lean tissue are observed, a significant decrease in total adiposity is noted in 4T1-bearing mice at day 28, compared with 66C4 (at day 35)- or nontumor-bearing animals (p < 0.05) (Fig. 2A). Similarly, a comparison of VO2 per tumor-free, lean body weight demonstrates a significant increase in oxygen consumption in 4T1-bearing animals compared with 66C4- or nontumor-bearing mice (Fig. 2B). Importantly, these observations are not associated with significant differences in systemic cytokine concentrations typically associated with cachexia (Supplemental Fig. 2). Changes in body composition, increased oxygen consumption, and increased acute-phase responses in 4T1-bearing but not 66C4-bearing animals. (A) The 4T1-, 66C4-, and nontumor (NT)-bearing mice were assayed at 0, 14, and 28 d post-4T1 tumor inoculation for total adipose tissue content via TD-NMR (n = 4–5 per group; *Tukey’s one-way ANOVA, p < 0.001). (B) Oxygen consumption (VO2) per total lean tumor-free body weight in 4T1 and 66C4 was measured at 0, 14, and 28 d post-4T1 tumor inoculation. Values represent mean ± SD (n = 4–5 per group; *Student t test, p = 0.004). Another facet of tumor-induced cachexia is a chronic inflammatory state due to soluble factors secreted by both the tumor and innate immune effector cells (2, 20, 21). This clinical state is associated with the induction and increase in hepatic acute-phase proteins (APP) during advanced stages of disease. As MDSCs have been shown to secrete increased quantities of inflammatory cytokines and chemokines (22, 23), we addressed whether the expansion of MDSCs contributes to the initiation or increased APP responses observed in cachexia. To this end, plasma was collected from 4T1- and 66C4-bearing animals at 0, 7, 14, 21, 28, and 35 d posttumor growth and assayed for the presence of three representative murine APPs, serum amyloid A, haptoglobin, and hemopexin. As demonstrated in Fig. 3, as early as 14 d posttumor growth, 4T1-, but not 66C4-bearing animals have significantly increased plasma concentrations of all three APPs. As the increased production of APPs is one of the hallmarks distinguishing inflammation-associated cachexia from simple inanition (1), these data further strengthen the hypothesis that MDSCs contribute to the chronic inflammatory milieu present during advanced tumor growth that may accelerate the development of cachexia in tumor-bearing hosts. (A) Plasma was harvested from 4T1- and 66C4-bearing mice at 0, 7, 14, 21, 28, and 35 d posttumor inoculation and assayed for serum amyloid A and haptoglobin via ELISA. Values represent mean concentration in ng/ml and are ±SD (n = 4–5/group; *Mann–Whitney rank sum test, p = 0.01; **Mann–Whitney rank sum test, p = 0.002; ***Student t test, p < 0.001). (B) Naive BALB/c animals were injected i.v. with 1 × 107 magnetically enriched Gr-1+ cells from healthy, nontumor, and 4T1-bearing animals at days 1, 3, and 5. Serum was collected at days 2, 4, 6, 10, and 14 and assayed for concentrations of serum amyloid A, haptoglobin, and hemopexin. Hashed lines represent values obtained from sham injections (*p < 0.05). We also i.v. administered 1 × 107 GR-1+ splenocytes obtained from both nontumor-bearing animals and 28-d 4T1 tumor-bearing mice into naive nontumor-bearing animals on days 1, 3, and 5. Serum was collected at days 2, 4, 6, 10, and 14 and assayed for concentrations of serum amyloid A, haptoglobin, and hemopexin. As shown in Fig. 3, although the acute-phase protein response was only modestly lower in animals receiving GR-1+ cells from a healthy rather than a tumor-bearing animal, both administrations produced a dramatic increase in the acute-phase response. This suggests that simply expanding the numbers of these cells is required to elicit an acute-phase response. Whereas these metabolic and immunologic changes are evident in the 4T1 tumor model in which MDSCs do expand compared with the 66C4 model in which MDSCs do not, it is possible that these observations are only true for 4T1. Therefore, we examined whether these changes in MDSCs also occurred in other classic models of murine cancer cachexia, namely LLC and CT26. As shown in Fig. 4A and 4B, murine hosts inoculated with either LLC or CT26 undergo a significant CD11b+Gr-1+ cell expansion in both the spleen and bone marrow. In addition, similar to 4T1, a smaller more immature CD31+ subset also expands proportionally with tumor growth. To determine whether these changes in myeloid cells also correlated with changes in body composition, LLC- or CT26-bearing animals were analyzed via TD-NMR. As demonstrated in 4T1-bearing animals, both LLC- and CT26-bearing animals had significant loss of adiposity over the course of tumor growth (Fig. 4C, 4D). Similarly, both LLC and CT26 animals had significant increases in oxygen consumption (Fig. 4E, 4F). Finally, we also measured the serum concentrations of serum amyloid A and haptoglobin (Fig. 4G) and show that LLC- and CT26-bearing hosts have significant increases in these acute-phase reactants as these MDSCs expand. Together these data support the findings from the 4T1 model that the expansion of MDSCs during tumor growth promotes and/or exacerbates cachexia in tumor-bearing hosts. Changes in adiposity, oxygen consumption, and acute-phase reactants also occur in other tumor models of cachexia following expansion of Gr-1+CD11b+ cells in the spleen and bone marrow. CT26 and LLC were inoculated into naive mice and followed for 21 d. Spleen and bone marrow (A and B) were harvested from tumor-bearing animals at 7-d intervals and plotted against tumor-free body weight (n = 5/group). Total host adipose tissue content (C and D) and oxygen consumption (E and F) were measured at 7-d intervals as well. Values represent mean ± SD (n = 5/group; *one-way ANOVA on ranks, p < 0.001; **Kruskall-Wallis one-way ANOVA on ranks, p = 0.002; ***ANOVA on ranks, p = 0.009). Finally, serum from tumor-bearing host was assayed via ELISA for the presence of serum amyloid A (SAA) and haptoglobin (G). Values represent mean concentration in ng/ml and are ±SD (n = 5/group; *one-way ANOVA on ranks, p < 0.05; **Kruskall-Wallis one-way ANOVA on ranks, p < 0.001). Patients with advanced cancer are known to be at increased risk for severe infection and sepsis (24, 25). 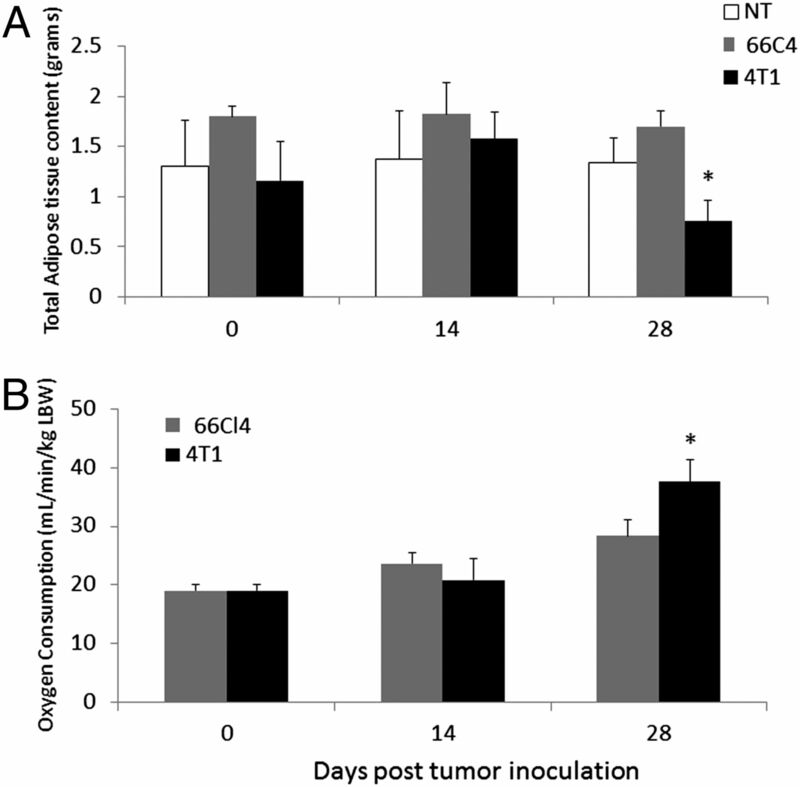 To examine whether the continued expansion of MDSCs observed in 4T1-bearing animals increases the susceptibility of these mice to infection, 4T1-, 66C4-, and nontumor-bearing animals with advanced tumor growth (day 28 post-4T1 inoculation) were exposed to a sublethal dose of endotoxin or polymicrobial sepsis. Again, due to the fact that the in vivo growth of 66C4 is slower than 4T1, 66C4-bearing animals were inoculated ∼7 d before 4T1 animals so that experiments were conducted in mice with comparable primary tumor burdens (day 28 for 4T1 and day 35 for 66C4). As shown in Fig. 5, advanced 4T1-bearing mice are more sensitive and have significantly higher mortality to sublethal endotoxin administration and polymicrobial sepsis compared with advanced 66C4- or nontumor-bearing animals. Late-stage 4T1-bearing animals have an increased susceptibility to endotoxemia and polymicrobial sepsis compared with 66C4- and nontumor-bearing animals. (A) The 4T1-, 66C4-, and nontumor (NT)-bearing mice at 28–30 d posttumor inoculation were exposed to sublethal dose of endotoxin (n = 20 per group; Fisher’s exact test, *p < 0.001). (B) The 4T1-, 66C4-, and nontumor (NT)-bearing mice at 28–30 d posttumor inoculation were challenged via cecal ligation and puncture (CLP) (n = 20 per group; Fisher’s exact test, *NT versus 4T1, p = 0.014 and **66C4 versus 4T1, p = 0.031). To understand the mechanism of mortality in 4T1-bearing mice in response to endotoxicosis, we harvested lungs and liver tissue from 4T1-, 66C4-, and nontumor-bearing animals at 0, 6, and 12 h postendotoxin administration. In contrast to 66C4- and nontumor-bearing animals, 4T1-bearing mice have significantly increased pulmonary infiltrate and liver necrosis/damage (Fig. 6). 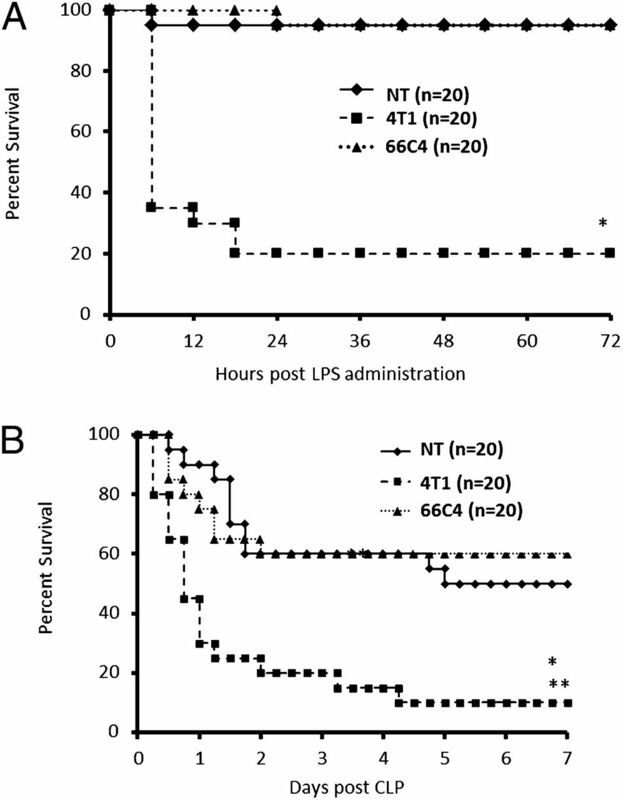 To further investigate whether this susceptibility to endotoxemia was dependent on the expansion and overwhelming numbers of MDSCs present in 4T1-bearing animals, 4T1- and nontumor-bearing mice were administered clodronate-encapsulated or PBS-encapsulated liposomes at 28 d post-4T1 inoculation and then subjected to sublethal endotoxemia. Overwhelming MDSC infiltration into lung and liver parenchyma following sublethal endotoxemia. 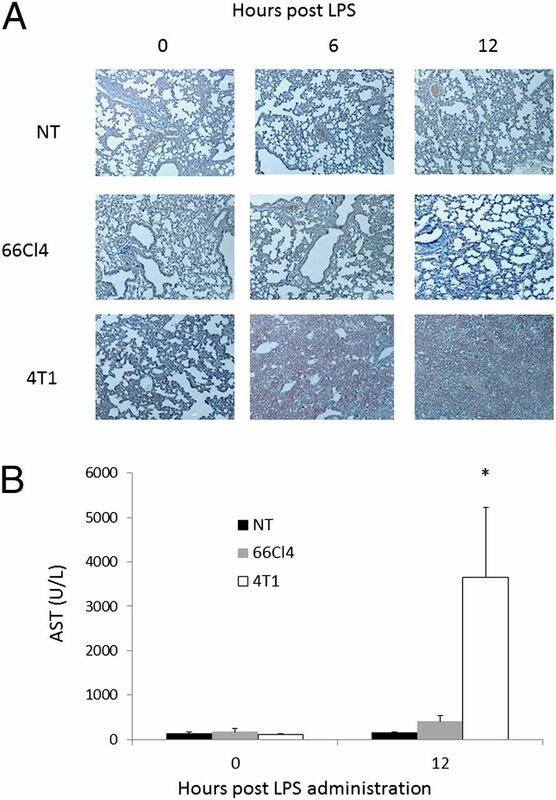 (A) Lungs were harvested from 4T1-, 66C4-, and nontumor (NT)-bearing mice at 0, 6, and 12 h following sublethal endotoxin administration, fixed in formalin, and stained with H&E. Images were taken at original magnification ×10. (B) Aspartate aminotransferase (AST) serum concentrations from 4T1-, 66C4-, and NT-bearing mice at 0 and 12 h (*n = 5 per group; Tukey’s one-way ANOVA, p < 0.05). As shown in Fig. 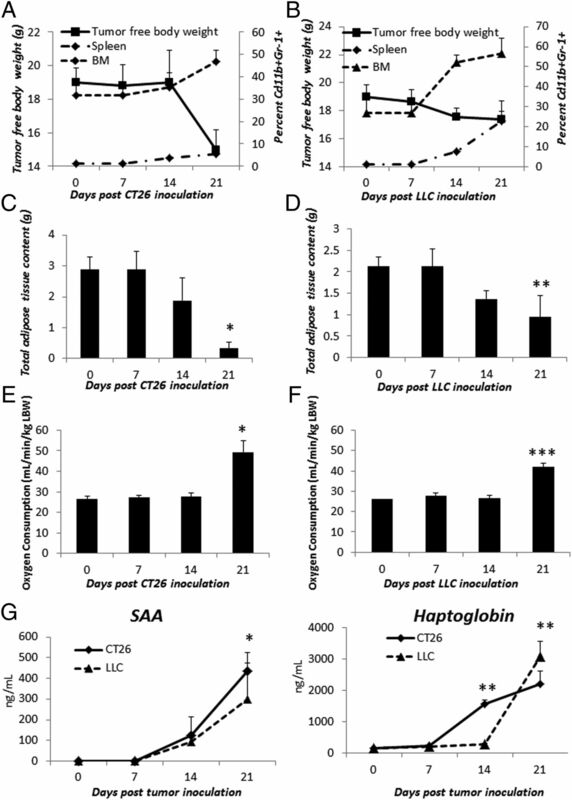 7, depleting phagocytic cells with clodronate-encapsulated liposomes reduces the numbers of MDSCs and reverses the susceptibility of these animals to endotoxemia. These data support the findings from the previous experiments and show that the overexpansion of phagocytic cells, including MDSCs in tumor-bearing hosts, is deleterious during advanced disease. 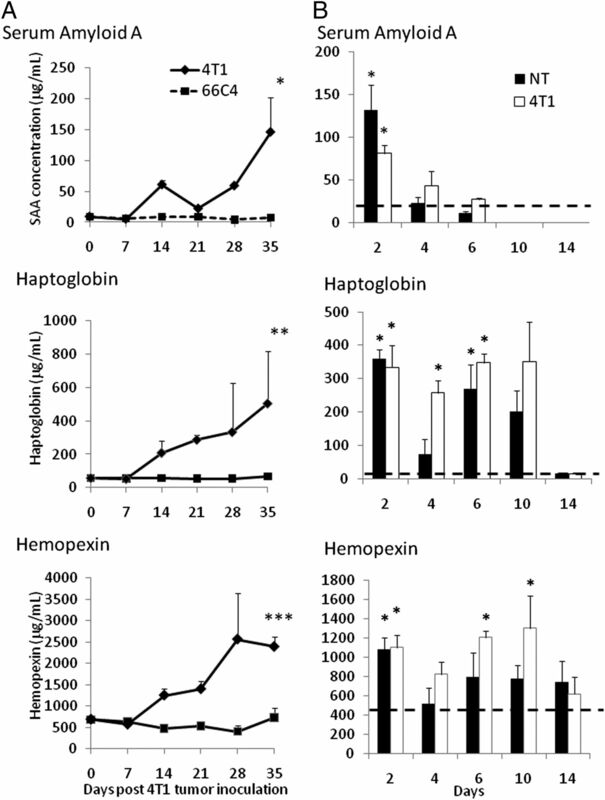 Depletion of MDSCs improves survival to endotoxemia in 4T1-bearing animals. (A) BALB/Cj 28 d post-4T1 inoculation were injected with either PBS or clodronate liposomes (Encapsula Nanosciences, Nashville, TN) i.v. at 100 μL liposome suspension/10 g body weight. Animals were then euthanized after 48 h. (B) Splenocytes from either clodronate (n = 5)- or PBS (n = 3)-injected animals were stained for CD11b+Gr-1+ cells, and absolute numbers of MDSCs were then calculated (*Student t test, p < 0.001). (C) The 4T1- and nontumor (NT)-bearing mice at 28–30 d posttumor inoculation were administered either clodronate or PBS liposomes i.v. After 36–48 h, mice were then injected with LPS (50 μg) i.p. and followed for 72 h (*Fisher’s exact test, NT versus 4T1 + PBS, p < 0.001; **4T1 + clodronate versus 4T1 + LPS, p = 0.013). Data presented in (C) represents the summary of two experiments. The role of tumor-induced myelopoiesis during the progression of cancer, leading to the expansion of MDSCs, is likely to have multiple effects on the host. Not only have MDSCs been found to contribute to the evasion of immune surveillance through the impairment of CD4+, CD8+, and regulatory T cell responses (19), they also have been shown to increase the growth and metastatic potential of cancer directly and indirectly through promotion of angiogenesis (13, 26). However, some of the soluble factors (NO, ROS, etc.) that have been shown to cause indirect adaptive immune suppression also promote enhanced innate immunity, and therefore increased resistance to microbial invasion. In addition, MDSCs produce multiple inflammatory factors that not only promote their immunosuppressive activity, but also predispose them to anaphylactoid responses (22). Therefore, we propose that the initial expansion of MDSCs and other myeloid-derived cells early during tumor growth may actually serve to increase innate immunity and pathogen surveillance during cancer and may represent a conserved host response to systemic stress and inflammation (27). Like any acute-phase response, this enhanced immune surveillance has metabolic costs to the tumor-bearing host, including increased energy expenditure, a hepatic acute-phase response, and expansion of the myeloid compartment, which, in the end, may also contribute to the development of cachexia (22, 23, 28). In this manner, the proposed model and mechanisms behind cancer cachexia are novel and may be expanded to include other inflammatory states associated with wasting and MDSC expansion, such as sepsis and active autoimmune diseases (27). MDSC expansion may have short-term benefits to the host, but, when prolonged, as occurs in advanced tumor growth, the early benefits of an initial MDSC expansion are outweighed by the adverse effects associated with cancer cachexia. We have used two independent approaches to support these conclusions, although both approaches have significant limitations. First, we have used the 4T1 mammary cancer tumor model because it is a well-established model of MDSC expansion (22, 29, 30) and has the added advantage that a well-described subclone of this tumor cell line, 66C4, does not exhibit MDSC expansion (22). The 4T1 behaves very similar to the LLC as a murine cachexia model. Like the 4T1 tumor-bearing mice used in this study, we have shown LLC tumor-bearing mice lose nontumor body weight that is predominantly fat, have a hepatic acute-phase response, and exhibit anemia and hyperlipidemia (31). Some investigators have also seen body protein losses in LLC-bearing mice with very advanced tumor growth (32). Although both 4T1 and 66C4 are highly metastatic, not surprisingly, the 4T1 tumor cell line grows more rapidly than 66C4 as a solid flank tumor and is presumed to become metastatic earlier. Whether this more rapid tumor growth and metastasis are secondary to the MDSC expansion is open to conjecture. We attempted to address these issues, however, by injecting 66C4 7 d before inoculation with 4T1, thus giving these animals an additional 7 d for the size of the primary tumor (Fig. 1, Supplemental Fig. 1) and presumably the metastatic potential to be approximately similar. Secondly, we recognize that the use of clodronate liposomes to deplete MDSCs in the cachectic 4T1 animals does not only deplete MDSCs, but also most other phagocytic cells, such as Kupffer cells, macrophages, etc. Therefore, it is difficult to distinguish the depletion of MDSCs from other phagocytic myeloid populations and their contribution to the improvement in survival observed in the clodronate-treated animals in response to endotoxin. However, the fact that depletion of phagocytic cells, including MDSCs, improved outcome to an inflammatory challenge (Fig. 7), coupled with the observation that 4T1-, but not 66C4-bearing mice with massive expansion of MDSCs were susceptible to the same inflammatory challenge (Fig. 6), suggests that overexpansion of MDSCs is contributory. In this study, we show that in late-stage 4T1-, LLC-, or CT26-bearing mice, a tumor setting in which MDSCs expand dramatically, animals display increased loss of adiposity, increased oxygen consumption, a hepatic acute-phase response, and increased susceptibility to infection. These data suggest that the presence of large numbers of myeloid cells, including MDSCs, in the 4T1 tumor-bearing host is sufficient to initiate chronic inflammation and demonstrate that these cells may play a novel and previously unrecognized role in the tumor-induced cachexia syndrome. One obvious question is through what mechanism(s) are these cachectic animals susceptible to inflammatory challenges, including endotoxemia and polymicrobial sepsis. Although these studies cannot resolve this question completely, the data lead to a strong suggestion. We looked at plasma cytokine concentrations in these animals, presuming that animals with expansion of their MDSCs and other phagocytic populations would respond to endotoxin and polymicrobial sepsis with an exaggerated inflammatory response. This was not seen. Changes in both plasma pro- and anti-inflammatory cytokines after endotoxin administration or polymicrobial sepsis were no different in 4T1-bearing mice than 66C4- or nontumor-bearing animals (data not shown). Secondly, we thought that perhaps the animals would be immune suppressed, and the cachectic 4T1-bearing mice would have rapid dissemination of bacteria from the peritoneal cavity after polymicrobial sepsis. This was also not seen. Blood bacteremia levels did not differ among the groups (data not shown) after induction of sepsis. In addition, the mortality in our model was not associated with either anaphylactoid responses, anemia, or thrombocytopenia (data not shown). Rather, the findings were more consistent with infiltration of large numbers of myeloid cells (see Fig. 6) into organs of the reticuloendothelial system, such as lung and liver, leading to organ injury. Although MDSCs from tumor-bearing animals are known to produce more inflammatory mediators (such as NO and cytokines) (19), administering Gr-1+ cells from a healthy animal produced a similar acute-phase response as did GR-1+ cells from a tumor-bearing animal. Such findings suggest that the sheer numbers of these cells, rather than their phenotype, may be more important for at least some of the acute-phase responses. It is important to note that we could not fully demonstrate that it was indeed the supraphysiologic numbers of these myeloid cells that are the mechanistic culprit for the increase mortality in the 4T1 animals. In fact, many investigators have used adoptive transfer techniques (up to 5 × 106 cells) to demonstrate gain/loss of function with MDSCs in either tumor or transplantation studies (19, 33–36). However, the adoptive transfer of hundreds of millions of Gr-1+ cells into either naive or 66Cl4 animals to recapitulate the massive infiltration of MDSCs into the lung following sepsis seen in the 4T1 animals is many fold higher than what has been used by previous investigators, and is not possible in these animals. Administration of this number of GR-1+ cells would most likely lead to pulmonary embolus and death, as the first pass of any i.v. injection is through the lung. Such findings have direct clinical relevance because some current antineoplastic therapies are aimed at blocking the expansion of MDSCs in advanced cancer (37, 38). Although such approaches are primarily targeting the immunosuppressive properties of MDSCs, an unexpected beneficial result of these studies may be a reduction in sickness syndromes and cachexia. Despite these limitations, the data within the manuscript suggest a previously unrecognized and novel association between the expansion of MDSCs and cancer-associated cachexia. As MDSCs have been recognized in multiple disease settings beyond cancer, their biological role is more than likely not limited to simply T cell suppression, although this is clearly an important obstacle to overcome in the application of tumor vaccines and other immune therapeutics (13, 39, 40). Therefore, based on these findings and other published data (13, 23, 27, 41, 42), the expansion of MDSCs during disease is most likely a conserved host response to a systemic inflammatory insult and, when unchecked, may lead to cachexia. Clearly, additional studies are required to verify and expand on these findings, but the current results provide strong evidence that one of the many results of MDSC expansion in advanced cancer is its contribution to the inflammatory and cachexia-producing responses. This work was supported in part by National Institute of General Medical Sciences Grants GM-40586 and GM-81923; National Institute of General Medical Sciences Ruth Kirschstein National Research Service Award Training Grant T32 GM-08721 in burns and trauma (to P.O.S., A.G.C., M.J.D., and K.M.K.-S.); and National Institute of General Medical Sciences individual National Research Service Award Training Grant F32 GM-093665 (to A.G.C.).
. 2011. Definition and classification of cancer cachexia: an international consensus. Lancet Oncol. 12: 489–495.
. 2008. Myeloid-derived suppressor cells in cancer cachexia syndrome: a new explanation for an old problem. JPEN J. Parenter. Enteral Nutr. 32: 651–655.
. 2008. Cytokines and their relationship to the symptoms and outcome of cancer. Nat. Rev. Cancer 8: 887–899.
. 1997. Proinflammatory cytokines, nutritional support, and the cachexia syndrome: interactions and therapeutic options. Cancer 79: 1828–1839.
. 1975. Causes of death in cancer patients. J. Med. 6: 61–64.
. 2010. Anti-cytokine strategies for the treatment of cancer-related anorexia and cachexia. Expert Opin. Biol. Ther. 10: 1241–1250.
. 2008. The prognostic significance of patient-reported outcomes in pancreatic cancer cachexia. J. Support. Oncol. 6: 283–290.
. 2008. A multicenter, phase II study of infliximab plus gemcitabine in pancreatic cancer cachexia. J. Support. Oncol. 6: 18–25.
. 1998. Chimaeric anti-interleukin 6 monoclonal antibodies in the treatment of advanced multiple myeloma: a phase I dose-escalating study. Br. J. Haematol. 102: 783–790.
. 2011. Chemokines in cancer related inflammation. Exp. Cell Res. 317: 664–673. 2010. Molecular pathways linking inflammation and cancer. Curr. Mol. Med. 10: 369–373.
. 2009. Tumor-associated macrophages (TAM) as major players of the cancer-related inflammation. J. Leukoc. Biol. 86: 1065–1073.
. 2011. MDSC in autoimmunity. Int. Immunopharmacol. 11: 789–793.
. 2002. Increased survival in sepsis by in vivo adenovirus-induced expression of IL-10 in dendritic cells. J. Immunol. 168: 3412–3418.
. 2005. CD11c+ dendritic cells are required for survival in murine polymicrobial sepsis. J. Immunol. 175: 3282–3286.
. 1993. Cachexia and the acute-phase protein response in inflammation are regulated by interleukin-6. Eur. J. Immunol. 23: 1889–1894.
. 2006. The origins of cachexia in acute and chronic inflammatory diseases. Nutr. Clin. Pract. 21: 68–81.
. 2009. Cancer-induced expansion and activation of CD11b+ Gr-1+ cells predispose mice to adenoviral-triggered anaphylactoid-type reactions. Mol. Ther. 17: 508–515.
. 2006. The epidemiology of sepsis in patients with malignancy. Chest 129: 1432–1440.
. 2001. Infectious morbidity in critically ill patients with cancer. Crit. Care Clin. 17: 531–570, vii–viii.
. 2011. Myeloid-derived suppressor cells are implicated in regulating permissiveness for tumor metastasis during mouse gestation. J. Clin. Invest. 121: 2794–2807.
. 2011. A paradoxical role for myeloid-derived suppressor cells in sepsis and trauma. Mol. Med. 17: 281–292.
. 2010. Direct and differential suppression of myeloid-derived suppressor cell subsets by sunitinib is compartmentally constrained. Cancer Res. 70: 3526–3536.
. 1989. Anticachectin/tumor necrosis factor-alpha antibodies attenuate development of cachexia in tumor models. FASEB J. 3: 1956–1962. Bennani-Baiti, N., and D. Walsh. 2011. Animal models of the cancer anorexia-cachexia syndrome. Support. Care Cancer 19: 1451-1463.
. 2012. TNF signaling drives myeloid-derived suppressor cell accumulation. J. Clin. Invest. 122: 4094–4104. Dolcetti, L., E. Peranzoni, and V. Bronte. 2010. Measurement of myeloid cell immune suppressive activity. Curr. Protoc. Immunol. Chapter 14: Unit 14.17.
. 2013. Down-regulation of PLCγ2-β-catenin pathway promotes activation and expansion of myeloid-derived suppressor cells in cancer. J. Exp. Med. 210: 2257–2271. Sanford, D. E., M. R. Porembka, R. Z. Panni, J. B. Mitchem, B. A. Belt, S. M. Plambeck-Suess, G. Lin, D. G. Denardo, R. C. Fields, W. G. Hawkins, et al. 2013. A study of zoledronic acid as neo-adjuvant, perioperative therapy in patients with resectable pancreatic ductal adenocarcinoma. J. Cancer Ther. 4: 797-803.
. 2002. Immature myeloid cells and cancer-associated immune suppression. Cancer Immunol. Immunother. 51: 293–298.